Michael Phelps is amazing. A legend. A terrific, trascendant athlete. No one is disputing this. But what some people are rightfully disputing is the completely irrational manner in which some people are trying to contextualize him. I won't link to Jemele Hill's recent ESPN article about Phelps because I would feel bad doing so (feel bad for you all having to read it, that is). I know, I know. "Look at the grumpy blogger. He couldnt do better, so he should shut up!" Well aside from illustrating the grammatical errors in the article, this post, from Good Guy at Sports, provides a thoughtful take on Hill's insanely hyperbolic feelings on Phelps. Go ahead and read that. As you'll see, people like Hill are going a little overboard with this Phelps praise, and leaving all traces of rational thought, logic, and acceptable grammatical constructions behind. Here is Hill's thesis: Phelps' Beijing Olympics represent the best athletic performance of all time, based on three criteria 1) endurance 2) diversity of achievment 3) record setting nature, and some other points, but these three seem most pertinent. - with regard to the notion of diversity of achievement: yes, Phelps won medals in different strokes. But Hill employs a kind of so-what philosophy about biking that makes it seem trivial when compared with swimming. Biking is just biking, but swimming is the BREAST STROKE! FREE STYLE! BUTTERFLY! A DIVERSE, COMPLICATED RANGE OF ATHLETIC ENDEAVOR! However, to me, the Tour de France is just as diverse too - mountain sections, flat sections, short sections and long ones. Similarly, Jordan is one of the game's msot famous dunkers, yet also possesses a signature turnaround jumpshot. Great athletes are great for lots of reasons. For Hill, this notion appears to only apply to Phelps. - every freaking swimming race in Beijing appeared to break a record. New suits, etc etc. And I'm not even a Lance Armstrong apologist - if you want one of those, I'm sure Dirkman is flying around in the comments section somewhere wearing a U.S. Postal jersey. I loved watching Michael Phelps this past week. I do think he is one of the world's all-time great athletes. But can we all agree to use logic and definitions when trying to place this thing historically? You know, like defining what skill is, or what endurance consists of, and how they intertwine? Please? Please Jemele? Please? I'm convinced the 'stache is actually Dave Wannstedt. A parody that's not really a parody. Although I doubt Dave is that smart. Jemele Hill is just horrible. She has her areas where she can write, but whenever she steps out to cover a different sport it just becomes an embarrassment for ESPN. They should hire a blogger. 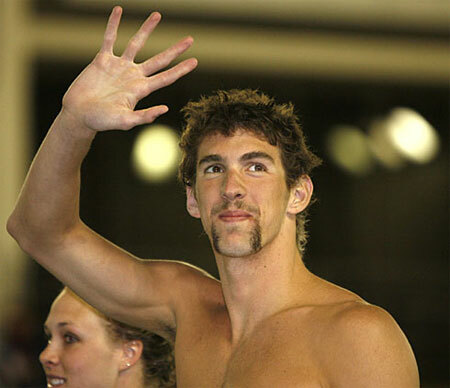 bahahahahaha the stache as michael phelps. wow. that did not occur to me at all when I put this up. I think now I am going to have nightmares tonight about the stache standing barechested with 8 gold medals around his neck. HEY! WHAT THE HELL!? dont name drop me like that!!! and besides usps cycling jersey are sweeter now than ever...they're throwbacks. just makin sure you are reading dirkman. you passed with flying colors. Good article...this Phelps stuff is a little over the top, the man is amazing, but hes not the second coming of God. If Chad Johnson applied himself in the pool, he would beat Phelps and set world records....along with every other amazing this country has to offer, but unfortunately swimming isn't that much fun. Your hair gets bleached a green blonde...there is no trash talking...I think swimming should take after horse racing, we should throw small jockeys on the back of Phelps and the rest of these swimmers.